In todays culture, building a sense of ‘team first’ can be a challenge because of the continual focus on individual success. People right from an early age are encouraged to be the star of the team because it is the stars that get the biggest rewards. Look at the attached picture and quote attributed to Cristiano Ronaldo, the Real Madrid champion who was won multiple World Player of the Year titles. 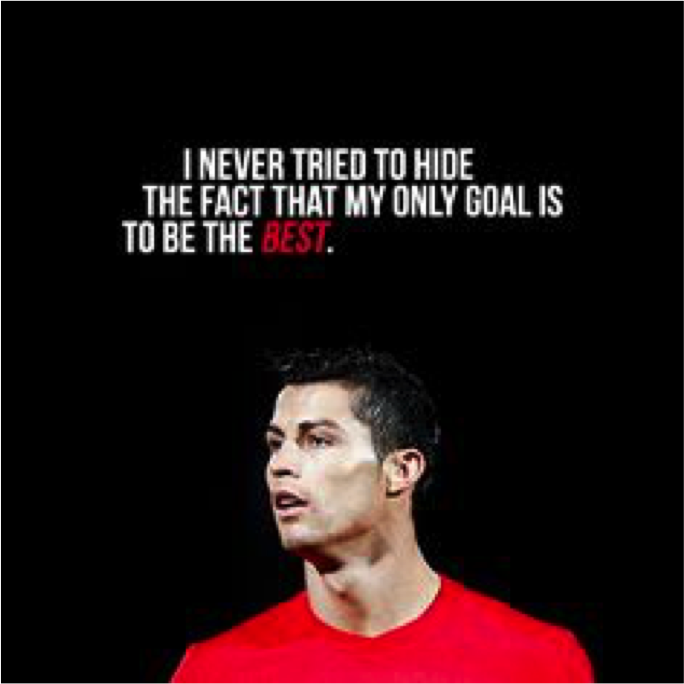 “I never tried to hide the fact that my only goal was to be the best’. On the surface it is an admirable goal. He should be congratulated for having the courage to put himself forward in such a manner. And he should also be congratulated for working extremely hard to get where he is. But to be honest, I would be far more excited about the quote if it came from a golfer, tennis player or even a darts player. The fact that it comes from a man who plays a ‘team sport’ and whose ‘only goal’ is to be the best is concerning. Worse, is that it comes from a man millions of young soccer players admire and want to be like. That is downright troubling. Ronaldo may think that he is contributing to his team by simply being the best player. Unfortunately you get the sense that a World Player of the Year may be more important to him than a League Championship. I wont even mention running away from your teammates after you score a goal ‘for your team’. At least in AFL we haven’t gotten to that stage, and I doubt we ever will. In many ways the idolization of individuals in team sports is diminishing the very fabric of what team sports is about – a group of people ‘working together’ to overcome and defeat another group of people. These days it’s more like one group of talented individuals beating a group of less talented individuals. It doesn’t have to be this way and we can change, if we learn to refocus on the joys of contributing to a team, rather than the joys of individual recognition. Start by asking every player in your team one simple question – what are you going to ‘give’ to the team? This may stump many of them as all they would’ve concentrated on is what can they ‘get’ from the team. When you have a group of people willing to ‘give’ rather than ‘get’ you will have a team. Finally a reminder – they don’t have 20-year reunions for people who win individual awards, only successful teams do that. If you would like more information on how to build your team go to Nathan Burke Consulting. Nathan Burke is the founder of Nathan Burke Consulting – a Melbourne based firm that offers High Performance training and coaching solutions corporates, schools and sports teams.